‚I visit the Jewish Museum regularly since the beginning of my work on the migration of Germans. I researched in the museum how migration of Jewish Germans took place during the Holocaust, which played a role in my project „Chronicle of a Place“. During Berlin Art Week I discovered the installation by James Turrell, which is housed in a temporary building on the edge of the museum garden. 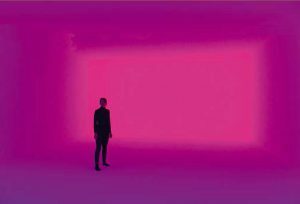 The installation is very much related to our perception of color. This reminds me of another project that I am currently working on. At the moment I am researching the forgotten Bauhaus master Getrud Grunow, who was active in Weimar. Grunow said that each person has their own color mood, which is related to all other colors in the outside world.